Happy New Year from all of us at V3 Media! This is the time of year when everyone makes their New Year’s resolutions (or not—we prefer to make goals ourselves!). However you want to approach them, the tradition of resolving to change for the better in a new year is a good one because it allows us to build some concrete plans on not only what we want to accomplish, but also how we are going to accomplish them. With that in mind, how about changing things up and making resolutions for your business’s website this time? These seven are concrete and achievable resolutions more so than renewing a gym membership that might expire anyway (sorry!). There’s very little time left until a brand new era arrives for all of us—we think now is a great time you caught up with the rest of the world in terms of online marketing! Several businesses, more than we can count, either use social media, a blog, an e-newsletter, or all of the above to promote their business and get their messages out there, all while keeping in touch with their customers. If content or social media marketing, for example, haven’t already been adapted by your business, the New Year should be your year to catch up at last. Other strategies, if you have the budget, include voice AI and chatbots as a means to stay in touch. However, really think these strategies through unless you’ve got a knack for the latest technologies. You can check out our articles on voice artificial intelligence and chatbot technology if you want to understand whether or not these strategies are well-suited to your company and website. The point is, whatever online marketing strategy you choose, it will benefit you and your business’s website in the long term. It will build greater trust amongst you and your customers, prove to Google that your website is worth ranking on its front page, and make your company sales that might have been lacking in the previous year. So make it a point to really stick to this resolution! Like Google, the rules of search engine optimization (SEO) change very often. Some basics stick around, such as the need for ideal keywords and title and meta tags to describe your website. Others, such as meta description tag length, seem to fluctuate constantly. It can be exhausting to keep up with these changes in rules! That’s why we follow white-hat SEO guidelines, because these rules in particular are pretty straightforward, plus they are one of the very few things that Google has not changed in the past couple of decades. Getting your site re-optimized, or optimized if it hasn’t been already, is not only a worthy resolution to make but also a goal you should keep in mind every single year. If there’s anything customers feel when they visit websites, it’s the need for speed! Having a good hosting plan in place such as our options at V3 can improve your website’s usability and loading time tremendously. Not many other hosting plans offer as much flexibility to redesign or stay current with the times, nor in almost all cases do these websites belong to the rightful people—i.e. the business owners themselves. If you’re unsatisfied with your current site’s host, or maybe you’re signed with V3 already and want to upgrade, this time of the year is as good as any to do just that. Mobile devices continue to dominate the way in which we access the Internet. Almost everyone uses a smartphone instead of a desktop computer to access websites…so get on board already! A new website with our plans at V3 ensures your website is mobile friendly from the get-go (doing so is in fact easier than simply redesigning your current website, especially if it’s under a different host altogether). If you want some other reasons why going mobile is a must, we’ve got some reasons for you right here. This resolution may not work out for every business out there, but in terms of real estate, this is growing to be a must feature for their websites. Many people who want to buy a house before they arrive at the physical building may not be able to do so right away for many reasons. They could just be shopping around out of pure interest, or they could be pressed for time. What VR, or virtual reality, can do is show would-be buyers the possibilities presented from your service or products (in this case, real estate). The customer can be presented with the actual contents of what you’re selling from a first-person point of view. Many devices catering to virtual reality are available on the market, but it may take an actual professional who knows what they’re doing to install it on your website without unwittingly creating bugs or glitches in the process. If some of our resolutions sounded great to you, but you don’t know where to start, why not start with a new website? If it’s been over 10 years since you changed anything about your current one, or you want to stay in tune with the websites of the New Year, or your site looks like it’s a relic from the 1990s still, maybe it’s time you really did catch up with us. We can help. 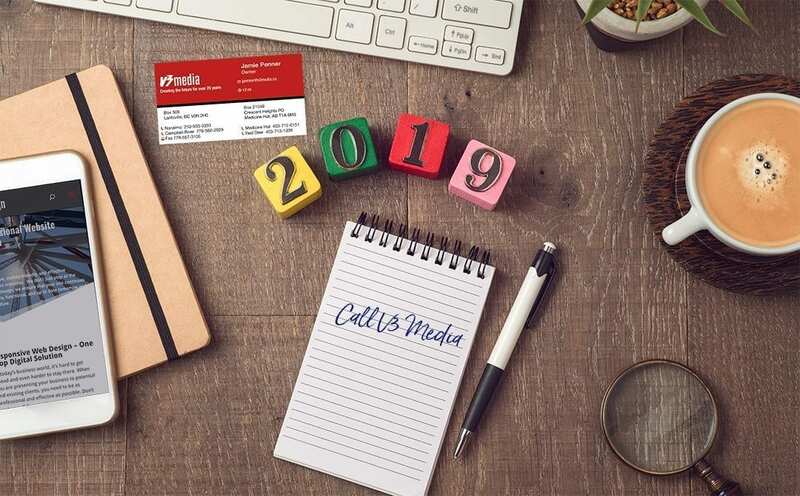 Give us a call at V3 Media if a new site is exactly what you’re looking for. If you’re still not sure, don’t worry—we’re available for one-on-one consultations if you need one of those first.